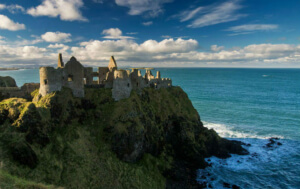 Northern Ireland has a cycling network of over 800 miles of quiet country roads, forest trails, riverside routes and coastal paths. 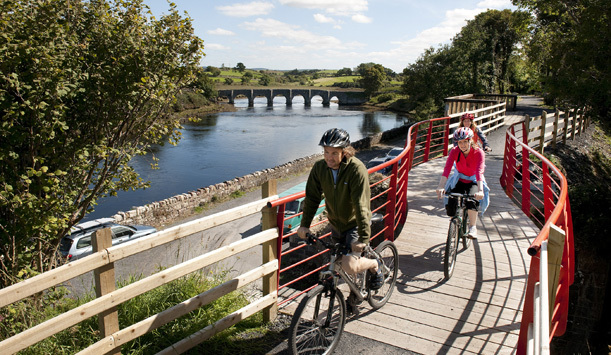 The Great Western Greenway is the Republic’s longest off-road cycling trail from Westport to Achill in County Mayo. Do consider cycling tours – they’re a brilliant way to get out into the great outdoors, have an eco-holiday and make a few new pals along the way. Most importantly – always cycle with traffic on the left-hand side of the road. Irish weather is famously varied, so pack gear for every eventuality. A high visibility jacket, helmet and good headlamp are recommended. Make sure to lock your bike at a designated area as improperly parked bikes risk being removed. A good lock is essential, and have a puncture repair kit handy, as there might be substantial distances between bicycle shops. For rental gear, Ireland has a generous supply of bike hire shops, and some will even allow you to rent your bike in one location and drop it off at another. The price of rental generally includes lock, pump, puncture repair kit, mudguards and carrier; insurance cover is given with all bicycles hired. The Road Safety Council gives advice on cycling safely and the rules of the road in Northern Ireland, and Dublinbikes has a good list of recommendations and rules for cycling in the Republic. Dublinbikes, Dublin’s city bike scheme, is one of the most successful of its kind in the world. The self-service bike rental system has 44 bike stations scattered throughout Dublin city, and besides a nominal sign-up fee it’s free to use. The best bet for visitors is the 3-Day Ticket for €2, which allows unlimited use of the bikes for the three days with the first 30 minutes of use free (services charges apply after the first 30 minutes so check on the website for full details). You will need to bring your own helmet with you. Bikes can be brought onto the Dart in Dublin and commuter trains for free during off-peak times, while there is limited space on Intercity trains and a nominal fee. Folding bikes are free on all trains at any time. On Bus Éireann buses, bicycles will be allowed only if there is enough room on board and this is judged by the driver at the time. Only folding bikes are allowed on buses in Dublin. In Northern Ireland all bikes are carried free of charge on Translink buses, Goldline Express Coaches) and trains (including the “Enterprise” service) after 9.30am.